Brick has traditionally been a popular choice for building construction for its durability and beauty. However, in recent years, commercial and residential construction has moved away from using brick and toward building with steel. Put simply, brick builds requires more materials, time and labor than steel, making brick the costlier choice to plan and erect. 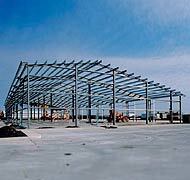 Steel building kits are prefabricated, reducing the costs typically associated with engineering and construction. A brick building goes up one piece at a time with plenty of adjusting and altering required on the work site. Weather has an effect on brick construction, with temperature and moisture playing roles in the stability of your finished product. Steel building kits, on the other hand, come perfectly prepared to assemble regardless of weather and without the need to make any cuts or changes to the materials on site. This requires fewer hands, less time and results in less mess to clean afterward. It also makes for a safer job site. All of this helps to cut costs and make steel the best choice. Brick buildings are far more vulnerable to wear and tear, especially when it comes to changes in temperature and the effect it has on moisture, because unlike steel, brick is a very porous material. As temperature fluctuates, so to will the state of the moisture that sets into brick. Freezing and thawing cause expansion and contraction, damaging brick walls, creating cracks that require constant repair. Moisture issues can cause other problems, too; mildew, mold and reduced air quality. Steel doesn’t struggle with moisture. In fact, steel can stand up to the most extreme conditions, including blistering hurricane winds, heavy snowfall and even earthquakes. Steel is built to last for decades requiring minimal effort and maintenance to retain it’s like-new look and performance. In 20 years, you won’t regret choosing a sturdy, cost-effective steel building still holding its value rather than a crumbling, expensive to maintain brick building. Steel is much friendlier to the environment, too. Steel buildings are highly energy efficient, offering better temperature control for heating and cooling purposes and doing a much better job of resisting and managing moisture. Steel is a fully recyclable material, losing none of its strength and durability through recycle and reuse. Because of this, most steel you’ll buy is made from recycled materials. Steel construction requires fewer materials than does brick, which cuts down on the environmental impact of manufacturing and material transportation. Some people prefer the aesthetic appeal of a traditional brick building. Luckily, metal buildings have come a long way in the looks department, now offering a variety of exterior options, including stone and brick facades, providing all of the aesthetic appeal of stone buildings without any of their practical drawbacks. If you’re planning to invest in a building of your own, Olympia Steel is the best choice you can make.